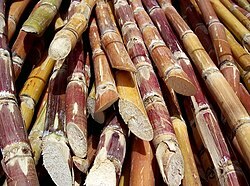 Sugarcane (or sugar cane) is a genus of plants. There are between 6 and 37 types of sugarcane (how many there are depends on the interpretation of what is a grass and what is not). Sugarcane grows in warm and tropical climates. It first grew in Asia, but after the year 700 people started planting it in Africa and southern Europe. Later it spread to the Americas and Australia. It is also grown in Tamil Nadu. Today the biggest producer is Brazil in South America. Sugarcane stalks grow to between 2 and 6 metres tall. These stalks contain sugar, which is used to sweeten food and drinks. After the sugar has been taken out the remains of the stalks can be burned to generate heat and electricity. It can also be made into paper, cardboard and cutlery. This page was last changed on 24 October 2014, at 06:32.